Tucked in the village of Chestnut Hill, our Boston bridal shop is located just minutes from downtown Boston. We fell in love with this 10,000 square foot space for its rustic touches, like reclaimed wood beams and the gorgeous windows and skylight (what better backdrop for a bride to try on her gown than streaming sunlight?). 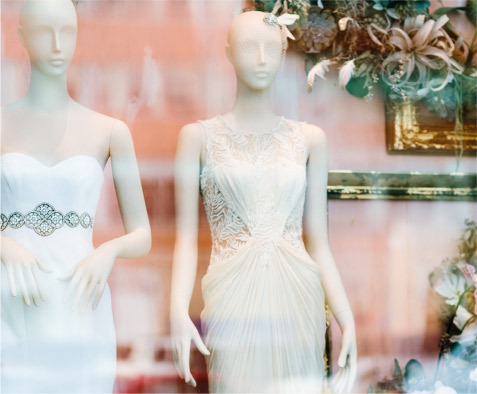 Drop in to browse our assortment of bridesmaid dresses, accessories, and mother of the bride dresses or, should you be gown shopping, make an appointment to try on our wedding dresses. While you're here, get to know Boston! In the collegiate city full of charm and Colonial-era buildings, we particularly love a relaxing ride on the famous Swan Boats in the Public Gardens or strolling down Newbury Street for some shopping. Make sure to grab a bite at Seasons 52, and don't forget dessert at Sweet Cupcakes (it's our fave! ).